Comparisons to the 1974 version starring Albert Finney are inevitable. However, it’s an oversight to dismiss a superb execution of the famous tale starring David Suchet. Over thirteen seasons, ITV brought to the small screen every single one of Agatha Christie’s tales about her infamous Belgian detective and his ‘little grey cells’. Every. Single. One. Let’s get to the meat: Traveling home from Istanbul, Hercule Poirot is given a last-minute ticket on the infamous train. It’s packed with guests from all walks of life, including a paranoid misanthrope named Ratchett. He’s convinced someone is trying to kill him and offers Poirot a small fortune to act as his bodyguard while they share the same train. Having seen how Ratchett treats his subordinates, the Belgian refuses. That night, an ear-splitting scream wakes half the train, including Poirot. The next morning, Ratchett is found stabbed to death in his compartment. To make matters worse, the train hits a snowdrift and is stranded in the middle of nowhere for several days. With no footprints to be found in the snow, it’s clear that the killer is still aboard the train. Poirot investigates, naturellement. What separates Orient Express from lesser murder mysteries is not simply the answer to the whodunnit. The further that Poirot delves into Ratchett’s death, the more he questions if the killer deserves to be caught. Where this interpretation differs from the original text is the depth of Poirot’s religious devotion. He is an extremely devout Catholic. It is a sin to murder, yes, but it could be a much greater sin to let his killer walk free... even if Ratchett was a disgusting viper of a man who most definitely had it coming. The ITV feature-length episode captures the isolation, the paranoia, and the tension of being stranded with men and women you simply cannot trust. Any one of the dozen guests could be a cold-hearted killer, and the only thing standing between them and getting off scot-free is a genius who always gets to the bottom of things. The question for POIROT is never “Will he get his man?” It’s almost always a matter of when or how. Here, the question is “What will he do when he uncovers the truth?” and that is where Suchet truly shines in the role. When the killer is unmasked, Poirot is beside himself. Ratchett should have answered for his crimes years ago, but instead has lived in the lap of luxury. His death finally means justice has been served— the only tenet our detective might put more faith in than his God. 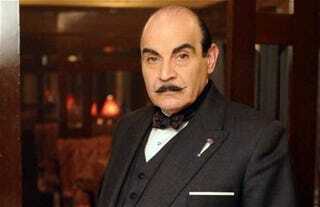 In the end, it is Poirot that decides the fate of the killer, but not in the way you might expect. Murder on the Orient Express is a sublime murder mystery, and I cannot recommend it highly enough. The version coming to the silver screen this weekend may or may not disappoint. But Suchet’s Poirot never will.